Serge Lutens’ Les Salons du Palais Royal is one of the great perfume houses of Paris. A legendary perfumer, Serge Lutens was once a photographer at Vogue Paris, a makeup director at Christian Dior, and director of design at Shisheido. The flagship store of this famous brand sits on an elegant covered arcade, one of three that surround Palais Royale, a French national monument built for Cardinal Richelieu in 1634. The arcades (which date back to the 18th century) now house art galleries, designer shops and upscale eateries. Because the palace isn’t open to the public and is inaccessible by car, the area is somewhat off-the-beaten tourist path. The shops are discreetly tucked behind tall trees and striped columns. A graceful park at the courtyard center offers a peaceful oasis for mothers with children and a few young lovers. Despite its low profile, Serge Lutens groupies, ardent shoppers, and connoisseurs of fine perfumes find their way here by word of mouth. Open since 1992, the walls and floors of the shop are covered in shiny black marble, a dramatic backdrop for the perfume displays lit with neon-like violet light. (Serge Lutens is said to have called black the ultimate color because it concentrates all the others.) Once inside, a visitor can’t tell whether it is day or night. A spiral staircase with an ornate wrought iron railing sits at its center leading to an upstairs room where visitors can learn about the brand and discover their own fragrance preferences. The line that began as a single fragrance now offers more than 50 different scents. Some are sold here—at Les Salons du Palais Royals—exclusively. Others available for export can be found at Barney’s, Bergdorf Goodman and some Neiman-Marcus stores in the United States. Sitting in the Moroccan-themed room at the top feels much like participating in a wine tasting in Napa or Bordeaux. The mystical space, painted in orange and green with an arrow motif, has 20 doors (only three of them open) around the perimeter with seats up around a long, low table in the middle. 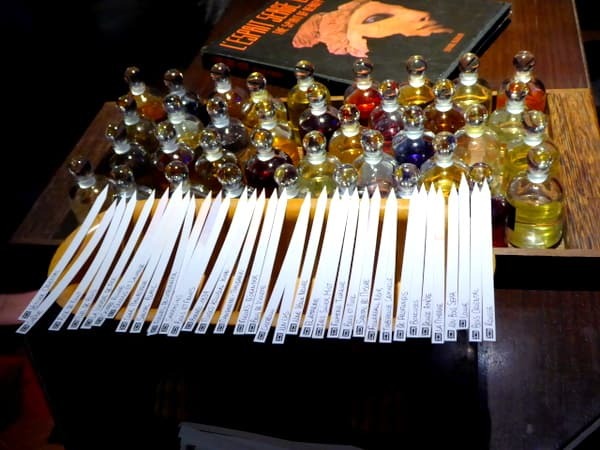 The knowledgeable and patient multilingual manager of the boutique, Soulaimane Alaoui, prepared blotters with the names of different scents in advance, and gave our small group the opportunity to guess the ingredients of each—and then to determine which scents we liked best. It’s not surprising that perfume trips are popular among women visiting Paris or some of the perfume producing regions of France. Get any group of women together around a table and there is likely to be a lot of laughter. We were told there are few strict rules when it comes to perfumes. Serge Lutens fragrances are unisex. Much like fine foods or wine, scent is a matter of personal preference: The same ones smell differently to different people and because perfume is an organic compound, it reacts with each person’s chemistry. Women commonly spray behind their ears and on their wrists but some spray inside their coats. To preserve shelf life, never keep perfume in the sun. Perfume generally lasts 6-7 hours. My favorite scent was Fleurs d’Oranger. Even if you can’t arrange for a formal “scenting/smelling” like this one, you’ll find it hard to resist leaving without making a purchase (I did.). The lovely bottles also make for a very special souvenir for your best friend. Open Monday to Saturday, from 10:00 to 19:00 (except holidays). Up to a maximum of 8 visitors at a time can arrange perfume trips to meet with a Serge Lutens employee. Although there is no charge, reservations need to be made in advance. We visited an historic perfume shop in Germany – it was very interesting learning about the scents, how the upper classes dabbed perfume on their hankies to cover their noses and mask the smells of garbage centuries ago, etc. The orange flower scent (is that what it is?) at Serge Lutens sounds like a winner :-). I’m ashamed to say I didn’t hear about this guy before reading your post. Very interesting post. I only learned about Serge Lutens after visiting the shop in Paris!